Temperatures are looking a little cooler for tomorrow than had been forecast a few days ago. Also, there is a slight chance of some flurries. Christmas day eve looks like mid 30s with Christmas Day and the rest of the week in the mid 40s. It will be warm enough to go out and try those new Christmas presents…a rod maybe!? The weekend looke like low 50 mid 50s with Sunday in the mid 40s. So far, New Year’s eve day looks pretty good….mid 40s. Lots of wading time the past three days. Generation projected for tomorrow with a break in the afternoon. We’ll see what the projections have to offer this week. Hopefully, we will be able to start the New Year staning in the water! Stan on the water last Tuesday with Robin and JoAnn from Oklahoma. First t6ime for these two and they had a very good day. 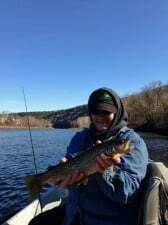 JoAnn did well and landed this nice brown shortly after she had hauled in a nice rainbow. Robin had to stay up with her so he brought in a beautiful 17-1/2″ rainbow. Best pattern was the pink lady egg. We hope everyone has a woderful Christmas and a safe, and Happy New Year! 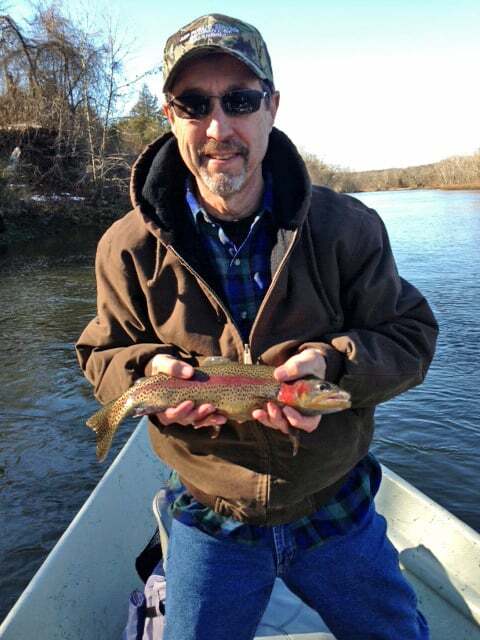 This entry was posted on Sunday, December 22nd, 2013 at 5:42 pm	and is filed under Fishing Reports. You can follow any responses to this entry through the RSS 2.0 feed. You can leave a response, or trackback from your own site.